An ailing God Almighty, Our Heavenly Lord and Father, was finally put to sleep this week by the human race. 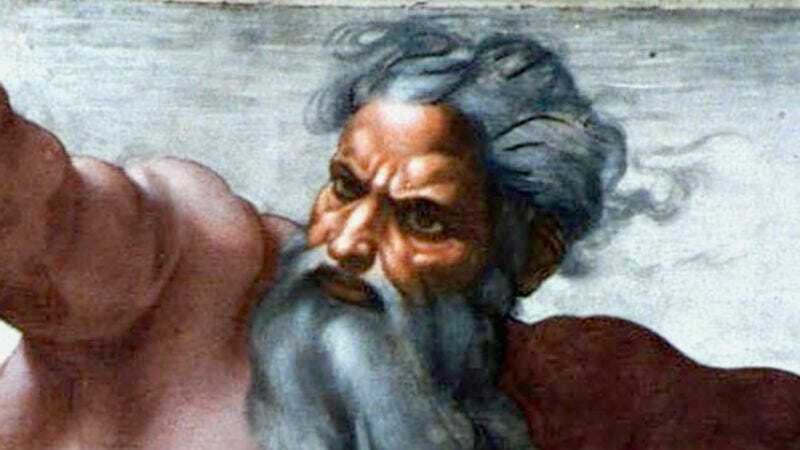 THE HEAVENS—Citing an inability to adequately care for the aging all-powerful deity, members of the human race told reporters Monday that they were forced to put down God, the omniscient creator worshipped by billions of followers of various faiths for more than 6,000 years. According to sources, at approximately 1:34 p.m. Monday afternoon the elderly Almighty Father was injected with a high dosage of pentobarbital, allowing Him to slowly drift to sleep before experiencing painless cardiac arrest followed immediately by death. In the hours since the passing of The Maker of Heaven and Earth, the human race told reporters that, while they certainly missed having Him around, they preferred to enjoy their fond memories of a younger and more energetic God. The world’s 7.14 billion people went on to admit that there were numerous instances when they considered putting God to sleep but ultimately relented. Despite reporting a distinct feeling of sadness and loss, the human race confirmed today that they were also reminiscing on many memories of the Supreme Lord and Savior’s life, from His very first creation of the heavens and earth, to the time He rambunctiously flooded the earth for 150 days, to His allowance of the Holocaust from 1938 to 1945, to the sweet sunset he conjured on the evening of July 12, 1998. “Maybe even two of them,” Huai added.